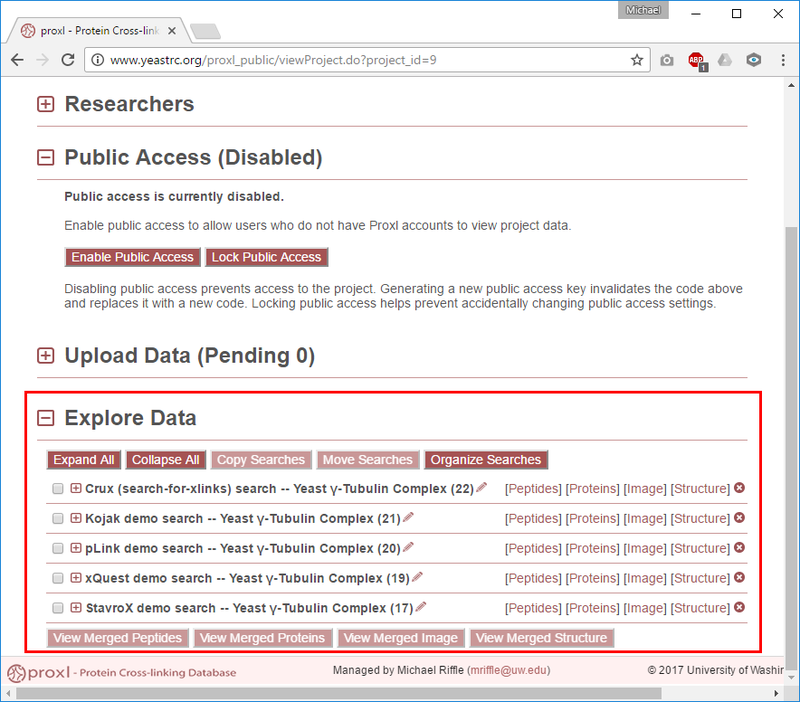 From here, you may edit the project information, add or remove researchers, toggle public access, explore or manage the data, and lock the project. Click the [+] icon next to each section to expand and view that section. Please see below for help on all of the sections. Project members may edit the title or abstract by clicking the pencil icon next to the respective item. Project members may add notes to the project by clicking “[+Note]”. Notes may be edited or deleted by clicking on the associated pencil or delete (X) icons. The title, abstract, and notes are visible to public users (if public access is enabled, see below). Projects that are locked may not be changed in any way until they are unlocked. This includes associated users, public access, uploading or annotating data, and so on. This is meant to accompany projects that are supporting publications, and so should not change. To unlock a project, the project owner may click on the lock icon next to the “Project Information” section header. The “Researchers” section of this page is not visible to public users. Any user may invite other users to the project. To invite a user to the project, click the “Invite User” text or associated icon at the top of the user list. This will open the following dialogue. Here you may designate their level of access (if you are a project owner) and click “Invite User” to invite that user to the project. The user will immediately have access to the project, and this project will appear in their list of projects. Alternatively, click “Cancel” to cancel the process. Once they have created an account, their name will appear in the user list instead of an email address, and the “Invited on…” text will no longer be present. Click the red (X) icon to the left of a listed user to remove that user from this project. That user will immediately lose access to the project and its associated data. This will not remove existing users, only revoke their access to this project. For invited email addresses, this will invalidate the access code included in the invitation email and they will not be able to use it to create a proxl account. Clicking the up or down arrow next to the access level of a user will either promote that user to an owner or demote that user to a researcher. Owners have complete complete access to a project, including the ability to lock or unlock it, enable or disable public access, promote or demote other users, define default views of data, or delete data. Only project owners may change public access settings. The “Public Access” section of this page is not visible to public users. Enabling public access allows access to the data without requiring that users have proxl accounts. Clicking “Enable Public Access” enables public access and changes the display of this section to indicate that public access is enabled. By default, public access is enabled in a way that requires a specially-formatted URL that contains an unguessable public access code. 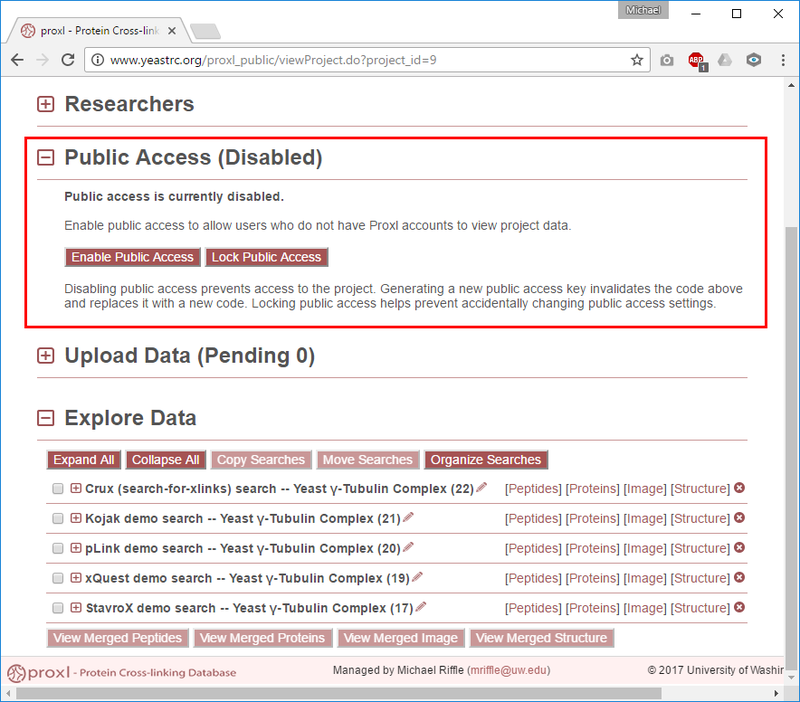 This URL is listed here as “Project public access URL.” This exact URL must be used to access the project before the user may access any of the data. This is useful for semi-private sharing of data with select users (or reviewers) without making the data completely publicly accessible. The requirement for the public access code may be removed by clicking “No” next to “Require public access code.” If “No” is selected, URLs for the project or any of the data pages may be directly shared without the need of the user to first use the public access code. This is useful for truly public sharing of the data, such as in the case of publication. The “Generate New Public Access Code” button will generate and replace the current unguessable public access code with a new code. This will revoke access to users that have used the previous code. Clicking the “Lock Public Access” button makes it impossible to change public access code settings without first clicking “Unlock Public Access.” This is meant to prevent accidental disabling of public access or generation of new public access codes, which would revoke previously-granted access to the public, colleagues or reviewers. We have set up a separate page describing uploading data. Please see Upload Data. This section lists each of the searches associated with this project. A “search” in this context are all the data resulting from running a software pipeline (e.g., Kojak or xQuest) against spectra data (e.g., a mzML file). Project researchers may change the name of these searches by clicking the pencil icon to the right of the current search name. To the right of the search name the search ID number is listed in parentheses as a standard way to refer to specific searches. Path - The path the data were in when imported into proxl. 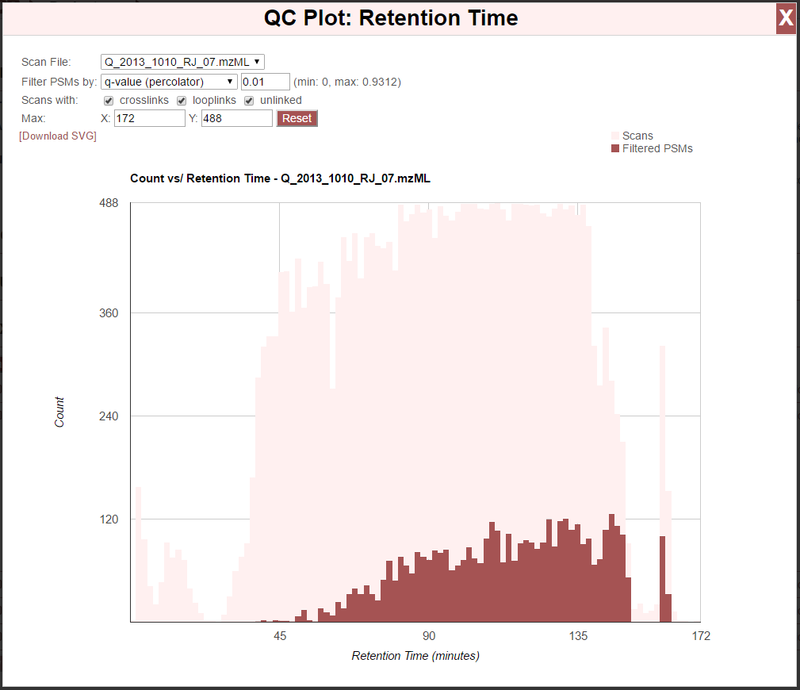 QC Plots - links to a retention time QC plot. See below. Raw MS data files - Links to RAW files that contain the raw machine output for this experiment. Project owners may add URL links to RAW files by clicking [+Link to Raw file]. Additional files - Links to additional files associated with this search, such as the configuration or parameters files for the respective search program. Comments - Lists the comments that have been added to the search. Comments may be deleted by clicking the red (X) to the left of the comment, or edited by clicking the pencil icon to the right. This is a histogram showing the number of MS2 scans taken versus retention time. 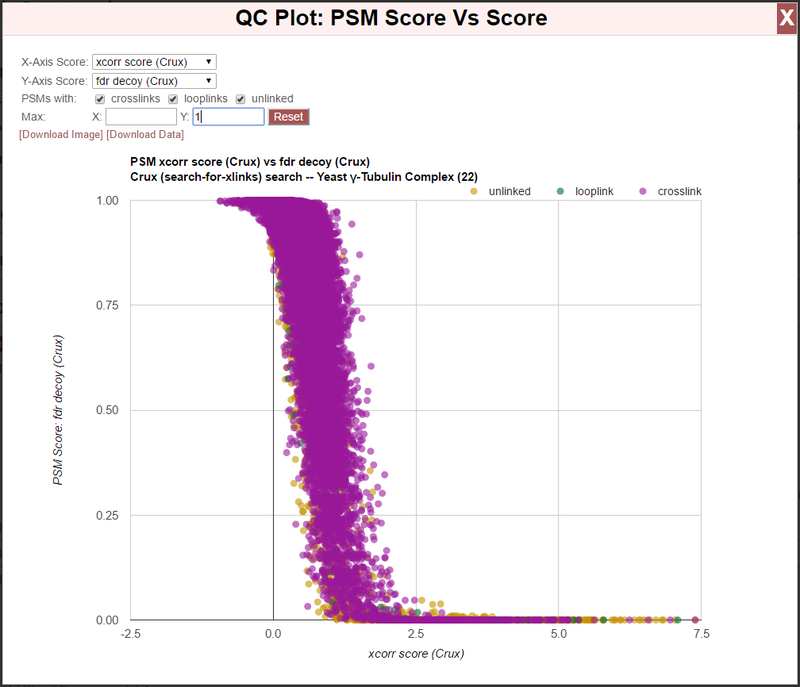 The pink bars show all scans, and the dark red bars show the number of those scans that meet our filtering criteria at the top of the plot–or, “Filtered PSMs”. To close the chart, click the “X” in the top right of the window, or anywhere in the browser outside the chart window. Scan File - If multiple spectral files were searched, each will be listed here. The data in the chart reflect the selected spectral file. 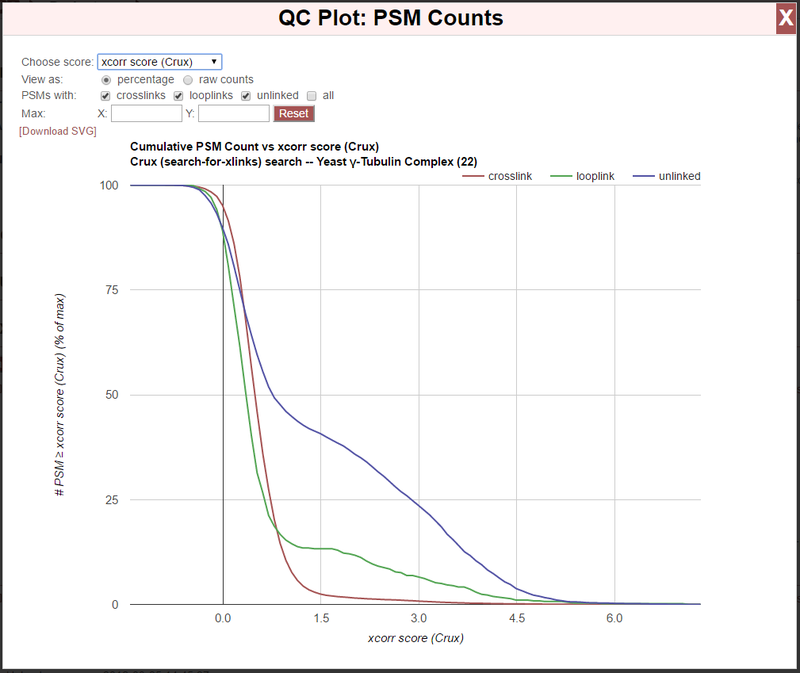 Filter PSMs by - Select the score type and cutoff value for that score to be used to plot the number of PSMs meeting those filtering criteria (red bars). The minimum and maximum values for the selected score type are given in parentheses. Scans with - Counts for “Filtered PSMs” will only include scans that resulted in a PSM where the peptide was of a type that is checked here. E.g., if only “crosslinks” is checked, only scans that resulted in crosslinked peptides will be used to for “Fitlered PSMs” counts. If “looplinks” and “crosslinks” are checked, only PSMs resulting in crosslinked or looplinked peptides will be counted. Max - Values entered here will be the maximum value on the X or Y axis–used for rescaling the chart. Possible values for the chosen score type are presented along the x-axis. Scores for which lower values are more significant, the y-value represents the number of PSMs with the value on the x-axis or lower. Score for which higher values are more significant, the y-value represents the number of PSMs with the value on the x-axis or higher. Each class of PSM is presented as a separate line: crosslinks, looplinks, and unlinked. A line for all PSM types combined may optionally be displayed by checking “all” in the “PSMs with:” options. The “Choose score:” option allows choosing which score from the search is used to generate the plot. The “View as:” option allows switching between raw counts (default) and percentage. The “raw counts” option uses the raw PSM counts for the respective types. The percentage option displays the PSM counts as the percentage the total PSMs of the respective type, and so applies the same scale to all lines, which will always move from 0 to 100 in the plot. The “PSMs with:” options toggle the visibility of the lines corresponding to the respective class of PSM. The “Max:” options allow for a user-supplied maximum for the X- and Y-axes. “Reset” clears the user-supplied maximum values. This is a scatter plot showing how PSM-level scores correlate with other PSM-level scores. For example, the above image shows calculated false discover rates (FDR) for PSMs vs/ the underling Xcorr score calculated by Crux. This can be used to discover unexpected relationships between scores, or to understand the effects of post processing statistical tools. X-Axis Score - The score to use for the x-axis. Y-Axis Score - The score to use for the y-axis. PSMs with - Select the type of PSMs to plot (cross-links, loop-links, and/or unlinked). Peptides - Provides a table view of the identified peptides and associated data. See Peptides View Page for more details. Proteins - Provides a table view of the crosslinks and looplinks at the protein level. See Proteins View Page for more details. Image - Provides a graphical view of the data where proteins are represented as proportionately-sized bars that are annotated with link locations within and between proteins in the context of sequence annotation data. See Image View Page (Protein Bar View) for more details. Structure - Provides a view of crosslinking data on 3D protein structures, including an interface for uploading PDB files and mapping sequences from the FASTA file onto those PDB files using pairwise sequence alignment. See Structure View Page for more details. 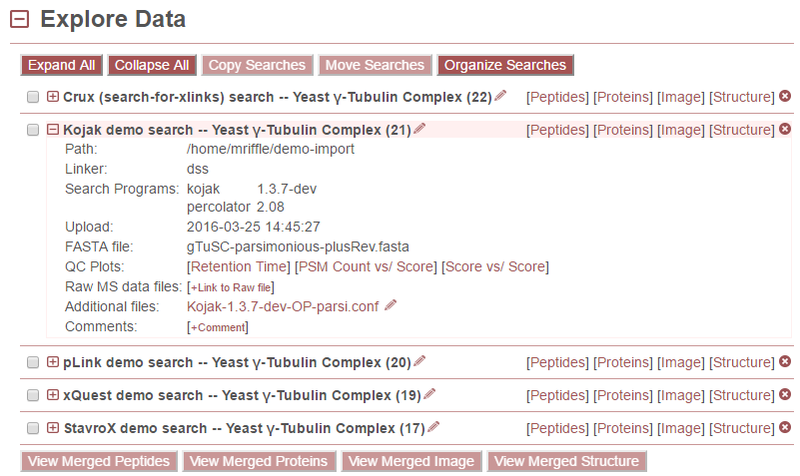 For more information please see: Merged Peptides View Page, Merged Protein View Page, Image View Page (Protein Bar View), and Structure View Page. Projects to which you have permission to copy data are listed. 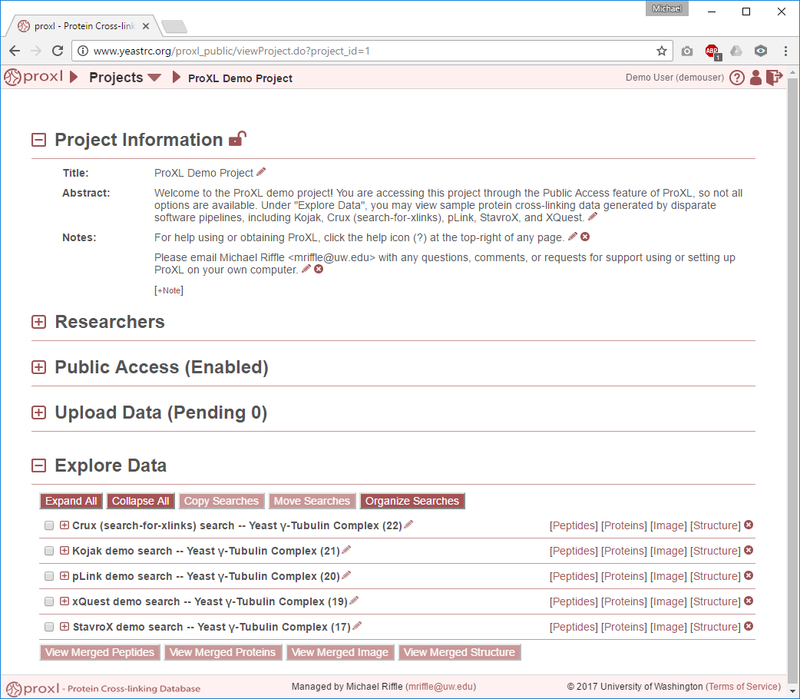 Click on the project name to which the searches should be copied. Copied searches are treated independently with regards to the search name, comments, and other search metadata. For example, adding a comment or changing the name of the search in the new project will not affect the original search’s name or comments. Projects to which you have permission to copy data are listed. Click on the project name to which the searches should be copied. Moving a search will remove it from the current project and place it in the new project. The “Organize Searches” button opens an interface for rearranging the search list and creating and placing searches inside of “folders” for improved organization when the project contains many searches. The right-hand panel is labeled “Search List”. This lists the searches contained in the currently-selected folder. To re-arrange the order in which searches are listed, click and drag the search to the desired order in the list. To see and re-arrange searches in another folder, click on the name of the folder in the left-hand panel. The left panel is labeled “Folder List”. This is a list of the folders that have been created for organizing searches. Note: Searches not in any folder are listed here under a special folder named “Unfiled Searches”. Any searches in “Unfiled Searches” will not be placed into a folder when shown to users in the web application. Folders may be deleted by clicking the small red “X” icon next to the folder name. Folder names may be edited by clicking the pencil icon. And folders may be re-arranged by clicking and dragging them to the desired position. To place a search in a folder, first click on the folder name that currently contains the search (remember, searches not in folders are under “Unfiled Searches”). Then click the name of the search in the right-hand panel and drag it onto the row containing the folder in the left-hand panel and release the mouse button. This will “drop” that search into that folder. When done, click the “Done Organizing Searches” button above the folder list to return to the normal interface. In the following example, the StavroX and xQuest demo searches were added to the “Treatment” folder. The Crux demo search was left unfiled. And the user has clicked on the “Treatment” folder to view the searches listed under it. 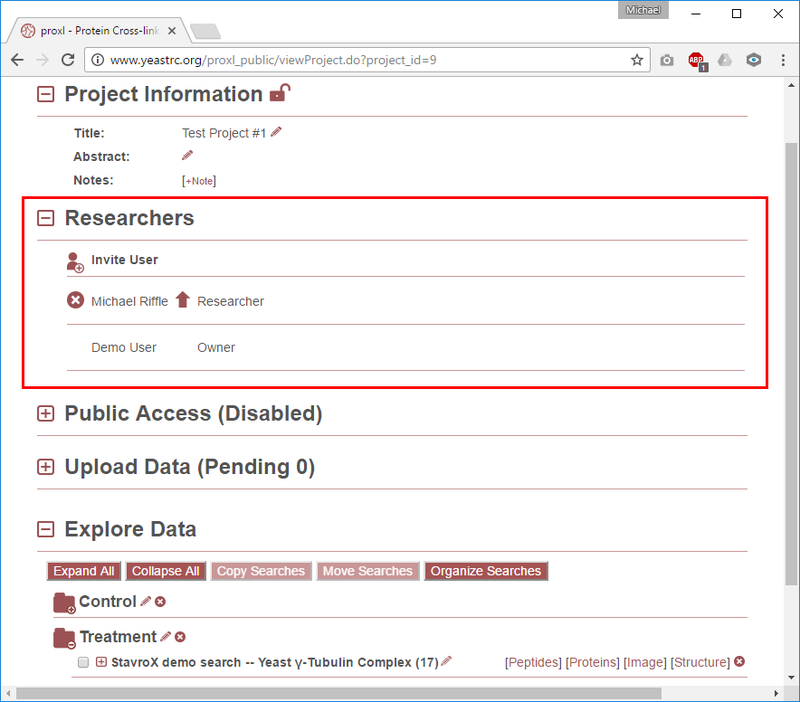 Project owners may delete searches by clicking the red (X) icon to the right of the view data links. This will remove all data associated with that search from the database–use with care. Note that if this search was copied to another project, that copy search will not be deleted.